The great trilogy finally comes to an end. But oh, what a glorious ending it is! For those who haven't read the books, there are some great surprises, especially near the film's climax. However, if you're like me and already know what happens from having read the books, then the true joy is in actually seeing it on the big screen in all its glory and color and beauty. The wondrous landscapes of New Zealand and the gifted talents of model-makers, costume designers, graphic artists, and others have brought Middle Earth to life as we could only have vaguely imagined as we read page after page of Tolkien's fantastic story. In fact, some of the film's most breathtaking moments don't involve the main characters at all. For instance, my favorite scene in Return of the King is when the signal fires are being lit from Gondor to Rohan. Not only are we able to get a glimpse of the beautiful mountain-tops, but we fly around them and among them. It is breathtaking. Literally, breathtaking. 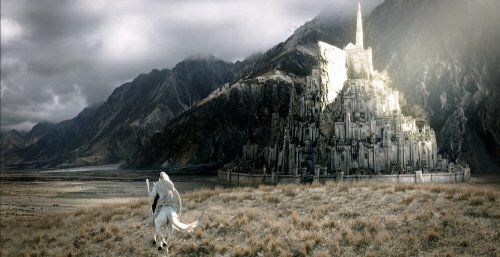 In any case, Gandalf and company pick up Saruman's palantir (a crystal ball used for communicating with Sauron) and then Gandalf and Pippin head off for the city of Gondor (pictured above) which will soon be under siege by Sauron's evil army of orcs. Meanwhile, Aragorn and company hang out in Rohan waiting for a sign from Gondor that help is needed. During this time, Frodo, Sam, and Gollum head into Mordor via a secret and very steep climb through the mountains. 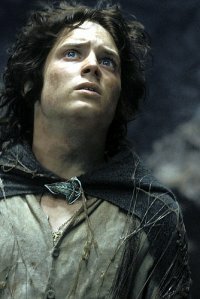 Along the way, Gollum is able to turn Frodo, who is weakened by the burden of carrying the Ring and is beginning to be corrupted by it, against his true friend and servant, Samwise. Gollum then leads Frodo into a trap wherein a giant spider (Shelob) awaits. The special effects on Shelob are outstanding and she is truly frightening. Back in Gondor, Denethor who is its Steward (kind of like a temporary king) has been corrupted by his own palantir and has foreseen the destruction of Gondor by Sauron. Unfortunately, the fact that Denethor has a palantir is never shown in the movie, even though his visions are admitted. In any case, this drives him mad and without hope he makes no attempt to prepare his people for battle. Gandalf realizes this and he gets Pippin to light a signal flare which will set off a chain of flares across the mountains to Rohan as a call for help. King Theoden answers the call and he and Aragorn and company head off for Gondor. However, along the way, Aragorn, Legolas, and Gimli leave for the Paths of the Dead, which the riders of Rohan take as a sign of giving up. 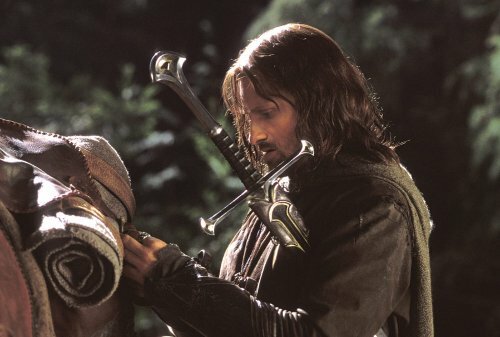 Aragorn, however, is the heir of Isildur and is able to negotiate with the ghostly dead to fulfill their ancient oaths and fight alongside him. The battle in the fields of Pelennor and in the city of Gondor is where Peter Jackson really works his magic. This battle is amazing, shocking, and simply awesome to watch. We start with orcs against the men of Gondor, and the orcs are overwhelming them. Then, in the nick of time, the riders of Rohan arrive and their horses plow through the sea of orcs trampling them as if they were insects. But then the wicked men arrive riding Oiliphants (think giant elephants - pictured below) which toss the riders and horses aside as if they were breadcrumbs. It was something fantastic to see horses being thrown through the air from the sweep of giant tusks. The next thing we know, all hell breaks loose when the Nazgul arrive on the scene flying through the air on their black, dragon-like creatures, picking up men and dropping them from the sky like eggs, all the while delivering their terrifying shrieks which pierce the souls and courage of men. All hope seems lost until Aragorn arrives with his ghost-like army, and Merry and Eowyn are able to slay the leader of the Nazgul, the dreaded witch-king who boldly proclaims, "No man can kill me" to which Eowyn is all too eager to respond with "I am no man!" as she thrusts her sword into his faceless head. 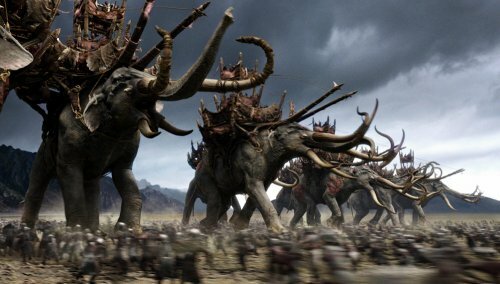 The victory at Pelennor seems like the end of the movie, until we realize that Frodo and Sam are in quite a mess and that Sauron still has quite a huge army left within the walls of Mordor. I don't want to spoil any more than I already have, but suffice it to say that the dramatic climax of this movie has a lot to say to us about struggles with temptation, corruption, and fear and how they are overcome with friendship, bravery, redemption, and love. A perfect example is when Eowyn says to Merry as they prepare for what appears to be a losing battle. "Are you scared Merry?" (He nods yes.) "Me too. 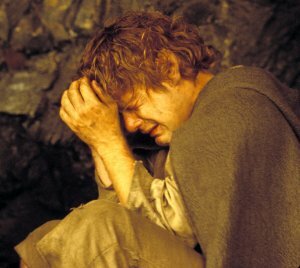 But let us be strong for our friends, Frodo and Sam." What is so wonderful about this story is that even though these characters exist in another world and time, their struggles and triumphs are not unlike the ones which we ourselves must face or experience. For us, to see temptation in the form of a Ring or to hear fear as the shriek of a Nazgul both simplifies and accentuates our own existence. When evil is personified as Sauron, orcs, or Uruk-Hai and that same evil can be defeated by sword, spear, or bow, there is an overwhelming sense of satisfaction leading to inspiration and confidence that we can overcome the evil in our own world. Sam says it best at the end of The Two Towers when against all odds and hope he says to a dejected Frodo, "I believe there's still some good left in this world, Frodo. And as long as there is, it's worth fighting for." And perhaps that is why these stories are resounding with so many people out there, besides just myself. To those who haven't seen these movies, SEE THEM. And then to those who haven't read the books, I do challenge you to READ THEM for you will not be disappointed. As for a comparison between the books and the movies, I would say this: the books contain much more than the movies ever could despite the fact that the movies are much longer than other movies out there, especially the extended editions. The Return of the King is 3 hours and 30 minutes long. And word has it that the extended edition will be 4 hours and 25 minutes! In addition, the books explain in much more detail the background and history of each character, creature, and city. However, what we can only imagine in the books we are able to behold and focus on in the movie, and for this special treat I must offer my sincerest thanks to director Peter Jackson and everyone involved in the making of The Lord of the Rings trilogy. 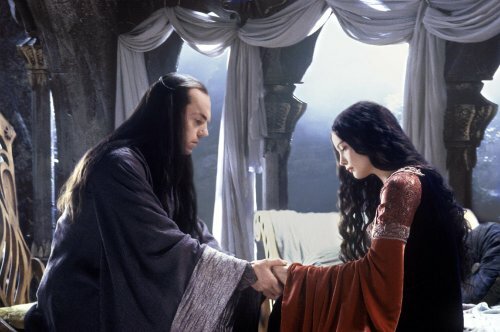 And Jackson and company even add a few new ideas of their own such as the struggle between the beautiful Elven Lady Arwen (Liv Tyler) and her powerful, yet powerless, father Elrond (Hugo Weaving). Theirs is a touching story of love, of holding on and letting go, but most of all, of hope. All in all, the makers of this trilogy have done a marvelous job. The movie ends shortly after the climactic sequence of events at Mount Doom, rushing through most of the character resolution in an attempt to not drag things out too much (as I feel the book tends to do) while still making sure to allow the audience to realize what happens to our favorite characters once the war with Sauron is over. Missing is the saving of the Shire from Saruman's rule, for in the movie it is left untouched, which is all the better since this minor skirmish is trivial in light of what takes place at Mordor. What is truly touching to see is Frodo's farewell to the undying lands with the Elves. It is a tearful goodbye both on-screen and off for much of the audience weeps along with Merry, Pippin, and Sam. For it's not just these three hobbits saying goodbye to one of our favorite characters, but we are as well. We're saying goodbye to Frodo and to the Shire and to Dwarves, Elves, and Wizards. One of our favorite stories has come to an end, that is, until we read it or watch it again. This could be the greatest trilogy of all time. 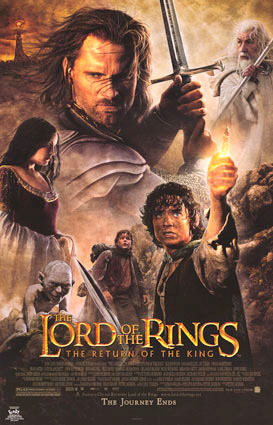 How would you rate the movie The Lord of the Rings: The Return of the King? There have been 35868 people to visit this page since Wed, Dec 17, 2003. And you are the first person to visit this page today!